It's true that businesses lose inventory through theft and robbery, however the risk is kept to a minimum for the clients of NEMECS! Ensure you have eyes watching when you or your staff simply cannot. NEMECS - the Cape Cod commercial security specialists - have been in the business of keeping commercial clients safe for over 16 years. With more than 16,000 system installs, why leave your surveillance to anybody else? Enlist our Commercial CCTV/Video Surveillance Service to keep your business, your staff and inventory safe. Chances are you've seen cameras in stores you have shopped in? Those are CCTV cameras and they record the movements of staff and customers in commercial premises both within and after business hours. 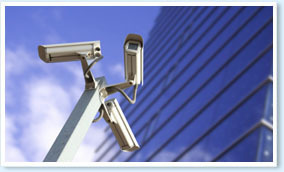 Commercial CCTV/Video Surveillance is a monitored service that works hand in hand with our Security Monitoring Center. One of our trained technicians will install cameras throughout your Cape Cod business premises. Once installed, your cameras will film and record the happenings of the day both during and after business hours. Movement detectors within the surveillance system can detect unusual movement, e.g. movement at the premises after hours, and this will notify our Security Monitoring Center, that will then notify you or send out a security officer to investigate. In some instances, the police, fire brigade or ambulance will be dispatched, once the nature of the disturbance has been confirmed. In the event that property has gone missing from your business premises, you can refer to the recorded footage to determine who was to blame, and this footage can be used to help prosecute offenders. To see just how effective and detailed CCTV surveillance can be for your business, why not take a look at our 3 Live Camera Demos online and view real CCTV footage for yourself? be assured that if a crime has been committed at your place of business, the recorded footage may lead to a prosecution. Doing business in Cape Cod? Act now and reduce the risk - arrange for your Commercial CCTV/Video Surveillance installation and activation today! All cabling, BNC Connectors and installation. We even offer in-house financing!